Myanmar has released its official strategy for developing its digital economy over the next six years, according to the Ministry of Planning and Finance. The Myanmar government signed the exchange of letters with China International Development Cooperation Agency (CIDCA) Thursday on industry and transportation projects in the capital of Nay Pyi Taw. Myanmar has sent about 1,000 workers to Thailand under the zero-cost system, according to the office of Myanmar labour attaché in Bangkok in Thailand on March 13. Guangdong province will cooperate with Myanmar to support the development of four sectors under the Belt and Road Initiative, Mr. Ouyang Weimin, Deputy State Administrator from Guangdong province government in China, said at the China-Myanmar Trade and Investment Forum held in Yangon on March 12. Myanmar is deliberating to form coast guard in order to strengthen maritime security, Deputy Minister of Defense Rear-Admiral Myint Nwe said. Rights groups are calling on Myanmar’s government to scrap a new land reform law they fear could leave millions of people with nowhere to call home. Surrounded by the hills of eastern Shan State, Laukkai township is a tranquil settlement of mainly Han Chinese people who are considered one of the 135 ethnic groups in Myanmar. The Myanmar military has been accused of detaining local aid workers and an ill man from Minbya township in Rakhine state on Tuesday night as the volunteers transported him to a hospital in Mrauk-U for treatment, RFA reported quoting relatives and residents of Kyaung Daung village. As clouds of acrid, black smoke belched above the flames engulfing an artisanal oil field in central Myanmar, prospectors from nearby hillsides arrived in droves, hoping for riches from a fresh line of black gold. With artillery exploding around her village in Myanmar’s northeast, 70-year-old Nan Nyunt fled to a monastery, one of thousands of civilians trapped between rebel groups who are fighting for influence as a China-driven economic boom looms. For thousands of years, people in Myanmar have been using thanaka to protect and care for their skin. But this ancient beauty habit is changing as the country opens up and modern make-up has become more available. Food and Agriculture Organization (FAO) has declared Myanmar, Laos, Cambodia and Vietnam have the highest potential risk of African Swine Fever (ASF) virus due to the spreads of ASF in Yunnan Province in China which borders Myanmar, said Dr. Min Thein Maw, Director of Livestock Breeding and Veterinary Department. A UN expert has expressed grave concerns about the implementation of a new land law in Myanmar, affecting a third of the country, and the disastrous implications for traditional farming communities in ethnic minority regions, Ekklesia reported. Wärtsilä has signed a five-year operation and maintenance deal for a 145 MW gas engine plant it is building in the Mandalay region of Myanmar. Residents of coastal villages in Tanintharyi Region say their livelihoods have been hurt by work on an LNG-fired power project involving European companies Total and Siemens. Your next travel destination should be one that takes you out of the ordinary and fills you and your travel companions with many wondrous memories. Vacations that involve sunbathing on the beach day after day can get monotonous, leaving very little distinction in your mind between the places you have visited. If you want a holiday which will leave you with many pleasantly distinctive memories, Myanmar should be your next travel destination. Complaints on high domestic airfares – many domestic flights are more costly than flights to Bangkok, Hanoi or Kuala Lumpur – and how it is hurting Myanmar’s tourism are gaining traction these days, with recent high-profile intervention from stakeholders in the hospitality sector. Bangladesh said Wednesday it would start relocating tens of thousands of Rohingya Muslims from overcrowded camps to a remote island vulnerable to extreme weather, despite the plan attracting considerable controversy. The Myanmar Country Programming Framework (CPF) outlines the priority areas of FAO support to and partnership with the Government of the Republic of the Union of Myanmar (GoRUM) in the six-year period from 2017 to 2022. The escalation of conflict in the Myanmar’s disturbed Rakhine state has triggered the deployment of additional troops by India along the international border to thwart attempts by rebels and refugees to sneak into the country. The charging and removal of a high level government official for corruption in Tanintharyi has roused concerns over how regional projects will be governed and run in the future. Mandalay Yoma Solar Energy, which operates solar mini-grids to power rural regions, will generate solar power in 500 villages within three to five years, the company said. 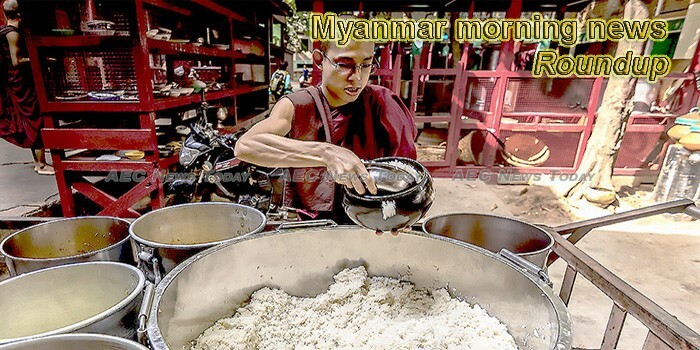 The 1000th edition is printed on March 14, 2019, soon after the paper’s Twitter account – with the Twitter handle @TheMyanmarTimes – attracted more than 400,000 followers. Both milestones consolidate the paper’s position as the leading print and digital media outlet in the country.